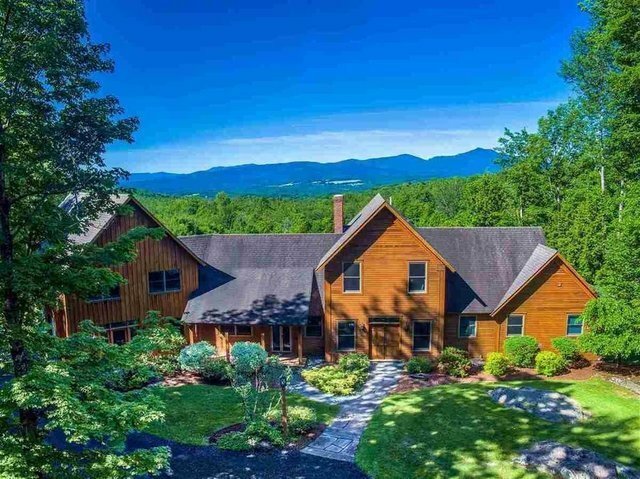 Contemporary,Farmhouse, Single Family - Stowe, VT This exceptional 30 + acre property offers luxurious country living in a gorgeous custom designed and built farmhouse-style home. The beautifully appointed South Hollow home features radiant heat, marble flooring and custom woodwork and has been impeccably maintained. The spacious open kitchen and seating area with wood burning fireplace and separate catering kitchen make it ideal for entertaining. In the warmer months you can dine alfresco on the inviting custom stone terrace with spectacular panoramic views of the Green Mountains. The living room offers floor to ceiling, two story windows to capture the views and has a beautiful stone fireplace. For year round recreation you can enjoy the extensive network of trails for hiking, horseback riding, snowshoeing or cross country skiing through the private neighborhood. The property has just recently been enrolled in the current use program.